On June 11th, 2004, I arrived in our hometown of Lisle, Illinois. While driving downtown on Main street, I discovered that one of the most historic and loved buildings in Lisle had been torn to the ground just two days prior. 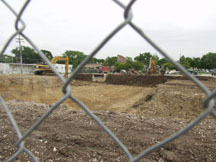 The Village of Lisle had decided to demolish the old Main Street School building. Lisle Main Street School. A Beautiful "Classic!" Converted to Lisle Village Hall. According to the construction workers at the site, no one was there to video tape the demolition. No "send off" party, no auctioning of artifacts, not even a last chance for town citizens and former students (which are many) to do a final "walk through" for history's sake. 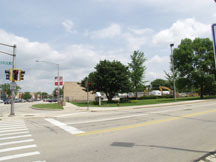 Lisle plans to replace the now flat lot with condominiums. Picture taken from S/E corner of Main & Burlington looking north into town. 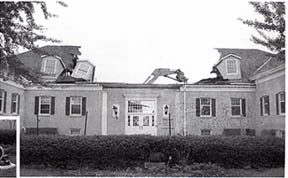 Notice the school or "Village Hall" is gone. 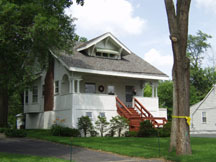 This historic house sat directly north of the school. It has been moved and sits today preserved behind old Lisle. If you didn't attended Main Street School, than none of this probably means much to you.. But for those many of us that did, the memories are incredible. 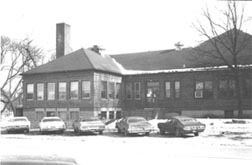 Main Street School was to be Lisle's first big project as a town. I talked to an old man (Mr. Van Bueren who still lives in Lisle and visits the Book Nook on occasion) who helped load the bricks off the train in the 1920s. Some of the only original Main Street School bricks salvaged from the site. One Can be seen at The Book Nook in Lisle. Anyone who went to school there probably still remembers the old gym downstairs. Or those old bathrooms with the windows that open right to the parking lot outside. You could always find some numskull in there smoking. It was perfect because you could flip the cigarette right out that window at any time. How about the smell of lunch lofting through the entire school around lunch time? Mrs. Borg was THE ORIGINAL "Soup Nazi." I can still hear her scolding someone to this day! I STILL think of her whenever I see one of those big wooden spoons! She'd nail ya right across the knuckles! Ouch!!! The real die hards will remember an old wooden door. It was in the hallway on that ramp that led out of the back of the lunch room and to the back stair case. If you ever sneaked in there like we did, you would have found an old dirt floored room that was used as storage. It was old, dark and scary as hell. Many called it the dungeon. I believed it! Finally, remember the old boiler room? It's where they used to heat the water for the radiators that heated the school. They used to burn the trash from the lunch room in this huge metal incinerator down there. The smoke would just go right up the stack and out to the center of town. Let's see ya try that nowadays! Anyway, other "exciting" plans for downtown Lisle include completely remodeling the fronts of all the classic old buildings on Main Street. Yes, the town feels it is time to have all the buildings looking exactly the same. Each one should look like the next. 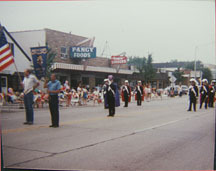 A Lisle parade passes "Fancy Foods" which used to be "Economy Foods" on Main Street. the design theme for the downtown Lisle area. Lisle's "revitalization" project reads: "Embracing Lisle’s image as the “Arboretum Village,” revitalization efforts will feature an “arbor/prairie” design theme. 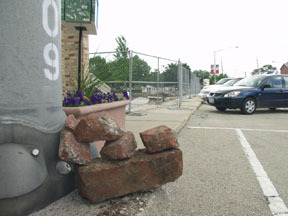 These improvements are recommended for all Downtown Lisle blocks."